The EB 305 and EBPro are designed and developed to restore the body's balance and energy levels, while facilitating and aiding in its natural detoxification process. They have been proven in clinical trials to balance and restore the body's pH and electromagnetic energy. The EB 305 and EB Pro use state of the art research and development to provide a form of energy that the body can readily use called 'Bioenergetic / Life Energy.' 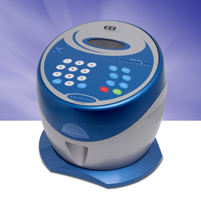 The EB cellular cleanse therapy is the only totally direct current unit on the market to ensure that no unwanted power transients or static sounds are passed onto the body. Healthy individuals can expect to feel lighter and experience a greater feeling of well being. Some patients with pain, edema, and swollen joints have reported relief immediately. Other patients with arthritis, allergies, gout, lymphedema, headaches, and neuralgia, as well as other symptoms have experienced relief and benefits with multiple treatments.